With the nascent cannabis industry projected to triple in the next seven years, investors adjusting to the possibility of a legalized infrastructure are beginning to pick and choose cannabis investment targets from an abundant pool. As more states add cannabis-related legislation to their ballots, U.S. legalization may be on the horizon. Investors are beginning to sift through the industry and single out the cannabis companies that will be here to stay in the long run. At least 2,740 companies, many of which are privately held, currently operate in the wide and varied cannabis industry, according to S&P Global Market Intelligence. The companies operate in the retail environment, real estate and cultivation, or the medical space as cannabis therapy developers. The medical marijuana space includes retail products or nutraceuticals that can be obtained via dispensary, and more traditional regulatory-approved medicines. Strategic Wealth Partners Ltd. investment strategist Robert Lambert said in an interview that private equity and venture capital firms look for either extremely high growth potential over a five- to 10-year period, or an under-managed company they can take over. Those investors are looking for sustained growth as a priority, especially as recently publicly listed companies have shown volatile stock movement, Lambert said. 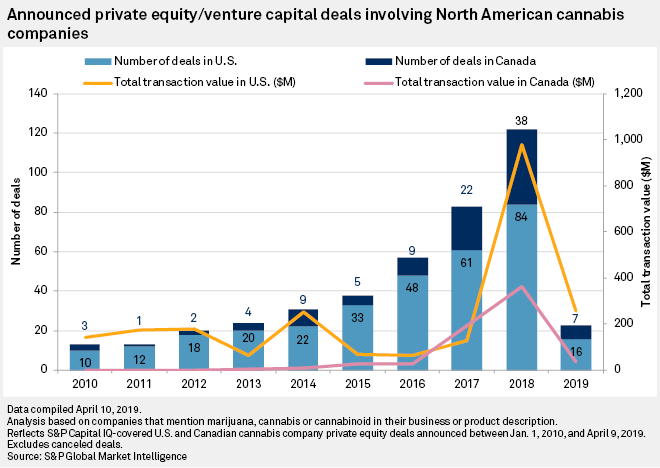 Private equity and venture capital investors could add further value to their portfolio companies and negotiate more attractive valuations than the public market might assign to cannabis companies, he added. Lambert pointed to Tilray Inc., for instance, which listed on the Nasdaq Global Select Market in July 2018. Since then the company's stock has seen wild swings — up 1,200% one day, down 70% another, Lambert said. 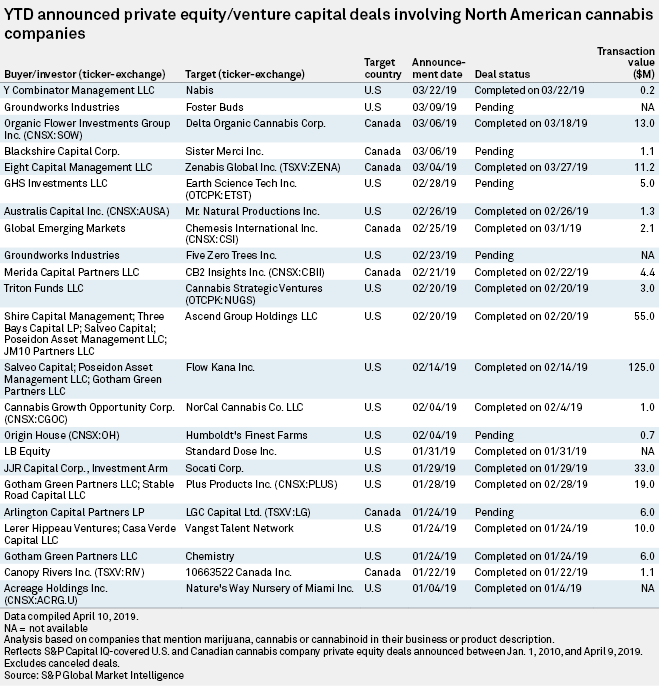 Tilray was previously a unit of private equity firm Privateer Holdings, Inc.
Of the public cannabis companies generating more than $2.5 million in revenue per quarter — indicating the top revenue generators in the cannabis industry — nine are listed on the NASDAQ, compared to 33 listed in Canadian markets, according to cannabis news publication New Cannabis Ventures. MKSI Investments co-founder Martin Kaufman, who also heads cannabis-focused venture capital firm Mesh Ventures, said the "valuations we're seeing in the Canadian markets are, in my opinion, somewhat inflated compared to [a] normal index company." Lambert noted that U.S. companies have about half the valuation of those in Canada — which enacted marijuana legalization in October 2018. "[We] are in the middle of an explosive growth industry," Lambert said. According to Lambert, total cannabis-related sales in 2018 — including illegal transactions — were approximately $300 billion worldwide. Three of the largest cannabis companies — Aurora Cannabis Inc., Canopy Growth Corp. and Tilray — occupy multiple spaces as cultivators and retail and medical distributors. Their "vertical integration" approach, meaning they own their own supply chain process for marketed products, has been achieved in part through an uptick in consolidation and M&A. "A lot of [smaller] companies are focused on specialty areas, and they start to see that's not a sustainable spot to be in within the industry," Lambert said. Jefferies analyst Owen Bennett also noted that smaller companies in particular may need to merge in order to compete long-term with the current dominant players. Because the cannabis industry is still new, many of the operating companies may lack the management experience to deal with the increasing competition, Lambert added. Karan Wadhera, managing partner of Casa Verde Capital LLC, also emphasized long-term growth as an important factor when investing in companies, especially amid a shifting legal environment in the U.S.
For example, Wadhera said a company centered on helping retail stores manage cash transactions may make sense in the interim and even be profitable the earliest. Differing U.S. federal and state laws mean most cannabis purchases are conducted in cash. But the business model may not be sustainable in the long term as laws change. "There's a structural component to the cannabis industry, versus maybe solving an interim issue in the current state of regulation," Wadhera explained. California-based Casa Verde, a venture capital firm founded by Calvin Broadus — also known as rapper Snoop Dogg — has invested primarily in "ancillary" cannabis companies, or companies that do not interact directly with the marijuana plant, in part due to the U.S. legal landscape. Casa Verde's portfolio companies include those focused on infrastructure, such as hardware for vapes or staffing services. Wadhera added that privately held ancillary companies are more reasonable from a valuation perspective because they are not the more common names associated with the industry, as cultivators and manufacturers might be. 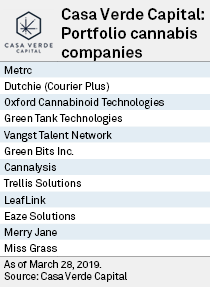 One exception to Casa Verde's ancillary portfolio is Oxford Cannabinoid Technologies Ltd., a U.K.-based biopharmaceutical company researching cannabis-based therapies for cancer and gastrointestinal conditions. Wadhera said the Oxford investment made sense for Casa Verde because the U.K. allows "a lot more freedom" in a federally legalized infrastructure. The U.S., meanwhile, has not developed standardized dosages for marijuana products, and regulations have restricted or outright banned research in the past, according to Lambert. The U.S. Food and Drug Administration has yet to provide guidance for cannabis products, though the agency has formed a task force to discuss cannabidiol, a popular cannabis constituent. U.K.-based GW Pharmaceuticals PLC is so far the only cannabis-focused pharmaceutical company to receive U.S. and EU approvals for its drugs, Epidiolex and Sativex. Lambert said the next five to seven years will see greater profits from the adoption of retail medical products, such as vape cartridges, cannabis oils, infused chocolates and gel capsules. In the absence of FDA-approved cannabis therapies, these products have been leveraged as an alternative, especially to opioid pain medications. "With research being at the current stage, we don't know how effective [cannabis] is for treating [certain diseases]. It's small signs of optimism at this stage, but that can be a decade-long process, and you might not get anything out of it," Lambert said. Legalization may normalize the growth rate of the cannabis industry, according to Lambert, and experts agree investment will continue to ramp up. "We're all fairly certain that we're moving ... toward full-scale federal legalization," Wadhera said. "I think people are now just so comfortable with what's going to be happening with certain bills in Congress … so there's less hesitation even to invest in businesses that are legal at the state level." Jefferies' Bennett in February projected federal legalization in the U.S. in 2023, European legalization in 2024 and 2025, and South American legalization in 2026 and 2027. 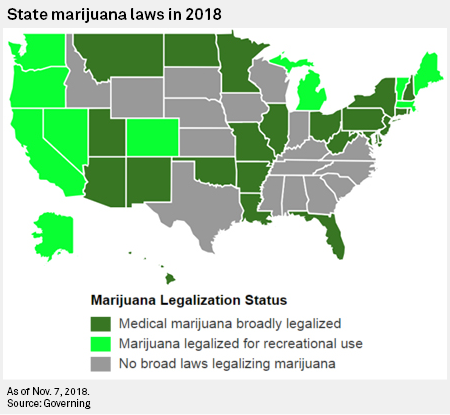 The U.S. is tiptoeing toward legalization; hemp was legalized as a crop in 2018, while several states added recreational or medical legalization questions to midterm election ballots. And some candidates for the 2020 presidential election have added marijuana legalization as part of their platforms, according to Wadhera. As legalization is achieved, Lambert believes that more crop growers will acquire land and produce more of the marijuana plant, thus depressing the price. "Growth might be overestimated when we look out beyond five years or so," Lambert cautioned. "I don't want to say a boom and bust growth story, but you might see the growth grow at that explosive rate here and then once we have widespread legalization, you might see it plateau or grow at a slower rate than a lot of people are forecasting at this point."